The Canine Intelligence Agency® (CIA) offers complete behavioral service and canine training. 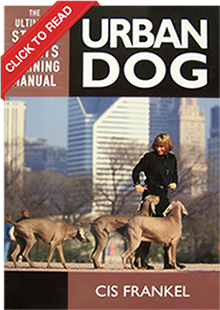 Headquartered in Chicago, CIA was founded in 1989 by Cis Frankel, a canine behaviorist, breeder of champion Weimaraners, and author of the highly acclaimed book, Urban Dog: The Ultimate Street Smart Training Manual. Frankel serves as a frequent consultant to veterinarians on canine temperament and behavior. Frankel’s dogs have appeared in TV shows, commercials, live theatre and at book signings. On this website, you’ll find all kinds of information, stories, tips, and products to help you raise your dog and strengthen this bond. Intelligent dogs have intelligent owners. If you can play with your dog, you can train your dog. If you can drink your coffee while walking your dog, you have a trained dog. If you make the rules, you must abide by the rules. Frankel believes the bond between owner and dog is strengthened by mutual work and play. “Your mission is to live, love, and laugh with your dog,” says Frankel.